The Guinness brewery in Dublin expanded rapidly in the 1870s as the world couldn’t get enough of its ruby red gold (it might look black but that’s an illusion). Horses and carts hauled hops, malt and casks around the site until 1873 when construction of a narrow gauge railway (tramway) began. This delightful little factory system operated for 100 years, ceasing work in 1975. 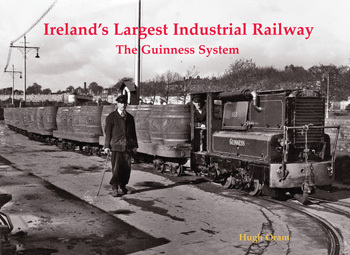 Hugh Oram’s book is full of photos of (mainly) this and the day to day workings of the brewery. As well as the internal tramway, there was also a broad gauge link to Kingsbridge Station which closed in 1965 and is also featured.